Shower rutine made shorter with Nivea - Cherry Colors - Cosmetics Heaven! As you may do remember, I talked about the sample I got back in December of the Nivea in Shower Body Milk. You can find the mention here. And since I had the lotion in such good thoughts, I decided to buy it as soon as I put my feet a drugstore. Of course, that just didn't happen right away, since I was trying to stay the heck away from them, but once I did get into one... well. I got some stuff. One of them was the Nivea Smooth Sensation In shower body milk. Oh, and the other? I was sent it by Nivea because I was wondering about the differences between the two. If you are curious as I was, keep reading :). What is an In Shower Milk? Good question. I was confused too, at first. Is it a body lotion? A shower gel? Do I use it instead of the shower gel or soap? No? It's actually an in-shower body lotion. As the name says, haha! You don't skip the washing part with your regular products, but you do however skip the fuss of applying the body milk outside the shower. Why? Because it's perfect for us, lazy people. I admit, I am extremely lazy and I never really bothered to use body lotions. Simply because one extra step was too much for me. Even when my skin was so dry, that it itched! Yes. I think this product is perfect for all the lazy people and all other who aren't used to apply body lotions just yet. It's a nice step in between. 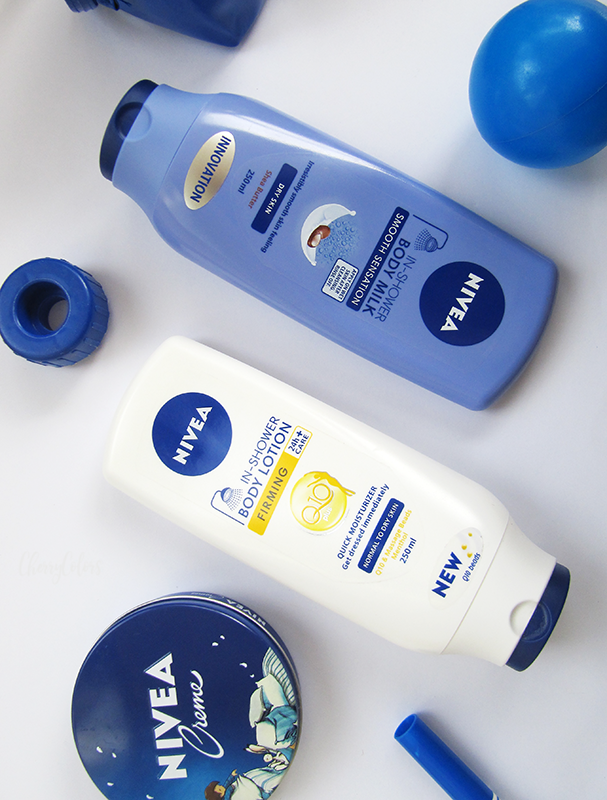 From Nivea they say that these products are like a hair conditioner, but for skin! Sounds fun, right? And it is. After you are done with your application on your still wet skin, you just rinse it off. Just like that. And you are basically done. Soft skin for days, well at least until the next shower ;). Now that we know what an in-shower body milk is, let's talk about the two versions I have. 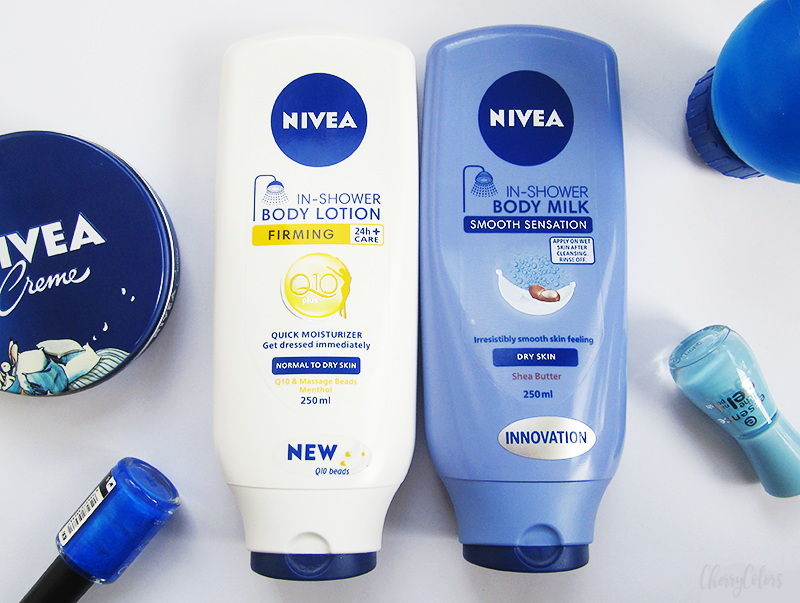 NIVEA In-Shower Smooth Body Lotion turns essential skin care into a daily ritual. Enriched with shea butter, it is specially formulated to nourish dry skin and has all the indulgent qualities of NIVEA Smooth Sensation Body Lotion. The result is an irresistibly smooth skin feeling without any stickiness or waiting around. Also suitable after shaving and depilation, this versatile product leaves the body feeling silky smooth and provides moisturization for up to 24 hours. The special NIVEA In-Shower Smooth Body Lotion fragrance is full of dreamy vanilla notes, which linger long after the shower. Meanwhile, the delicate floral bouquet of precious white musk, sandalwood leaves the skin feeling positively pampered from day to night. The first Firming Skin Conditioner from NIVEA®. A new way of easy and pleasant skin firming. With visible Q10 beads.Wet skin can directly take up the caring formula, which is quickly absorbed. Result: smooth, soft skin already when stepping out of the shower. There is no need to apply a normal body lotion afterwards. I don't know about the firming effect, but it does leave my skin nice and smooth. And the scent that is a bit fresh, menthol like, makes me feel more awake. Did your "lazy" person in your also scream FINALLY when you saw this product? Let me know in the comments.